Sunshine to the Square Inch: What's holding you together? What holds you together? What is it that makes you keep going day in and day out? What is it that gets you through those hard times? I think if I asked those questions to a variety of people I'd get a vast array of different answers. I think the answers would be something along the line of community, friends, family, positive thinking, hard work, planning and preparing for hard times, etc. The list could go on and on. While all those things are good I think God has a different answer. To be honest, I didn't think too much about all of this until I sat down the other day to do my devotions and I read II Corinthians 5:14a which says "for the love of Christ constraineth us". Constrain is a word that I didn't know exactly what it meant so I looked it up and it means: to hold together lest it fall to pieces or something fall away from it, to compress, to press together with the hand. I stopped right there and was just blown away. I realized that it is the love of Christ that holds me together or else I'd fall to pieces. It is the love of Christ that presses me together and holds me in his hand. It is the love of Christ that died on a cross for my sins and rose again. It's with His love that my salvation is secure. Just to be super practical and honest - it's by Christ love and holding me together that He has brought me through some seasons of depression. His love has brought me back from seasons of rebellion. Christ's love has held me and my family together as we said goodbye to loved ones who have passed away this year. 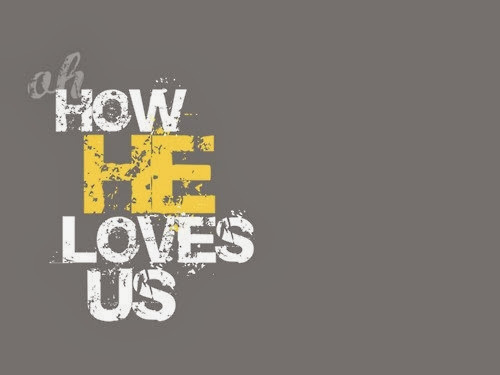 It's all by His love. I don't think Christ love is just there for the bad times though. I think His love has given me a godly husband that loves me, a family that is close even though we are miles apart, good Christian friends that I can have the time of my life with, times filled with laughter, seasons of peace, and on and on. Thinking on this verse made me so grateful of the love Jesus has for me and I hope it does the same for you because you are loved! Great post and ALL so so true! I love this! Thanks for sharing. Seems like we were having similar thoughts this week :) Great thoughts on the verse. I love how you weren't sure what the word meant so you went and looked it up to go a little deeper.